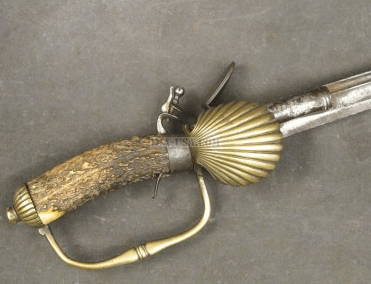 A VERY GOOD AMERICAN REVOLUTIONARY WAR PERIOD HORSEMAN’S SABER/HANGER, ca. 1770: In overall very good+ untouched condition. The unmarked, 29 1/2″, curved blade with a single edge with several old Battle Related? Nicks on its cutting edge: of likely American manufacture. The Copper-alloy mounted hilt with a pillow-type pommel with ball-form capstan, a D-form knuckle-guard (the rear with a piercing for a horse’s reigns) and slotted hand-defense with an integral upper quillon. Finely braided, copper-alloy, chain-wrapped, wooden grip with squared surfaces and a finely braided chain-type, copped grip-wire/wrapping. In overall very good+ untouched condition with gunmetal-gray steel surfaces with some light scattered pitting and rust-stains. The blade retains its original cutting edge with untouched patina and several Battle-related nicks. 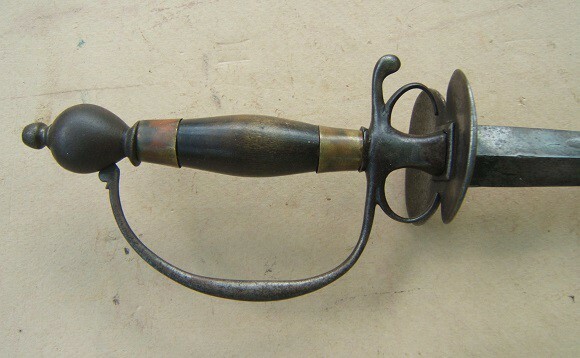 Fine quality American hilt with a lightly toned patina and very nice surfaces. 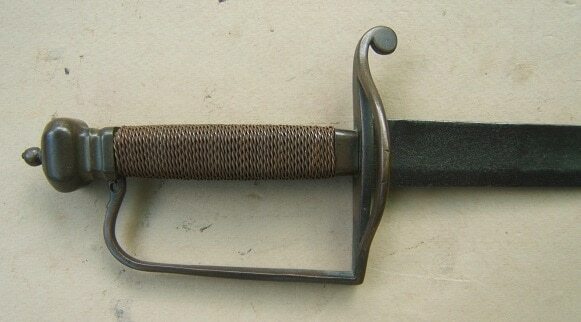 A very nice example of an American Revolutionary War Period American-made Horseman’s Saber/Hanger, ca. 1770. Overall length, 35″.